Diadegma insulare, shown here along with one diamonback moth larvae, are known to sometimes completely terminate diamondback moth outbreaks in Western Canada. Producers are encouraged to carefully monitor pest and natural enemy populations to make sure insecticide applications are necessary. That’s because, as this study shows, parasitism of diamondback moth larvae and pupae can be relatively high early in the season. Lloyd Dosdall, entomologist with the University of Alberta, focused this 2010, 2011 and 2012 study on the parasitoids that help keep diamondback moth populations regulated. Parasitoids of diamondback moth are poorly studied in canola, even though the parasitoid Diadegma insulare is known to sometimes completely terminate diamondback moth outbreaks in Western Canada. Two other parasitoid species – Microplitis plutellae and Diadromus subtilicornis – also attack diamondback moth and sometimes inflict high levels of parasitism. The aim of this project was to develop forecasting strategies to predict abundance levels and distributions for these three parasitoids. Surveys in Alberta and Saskatchewan determined the parasitoid fauna of diamondback moth in canola, and assessed the levels of parasitism in different sites and ecoregions. 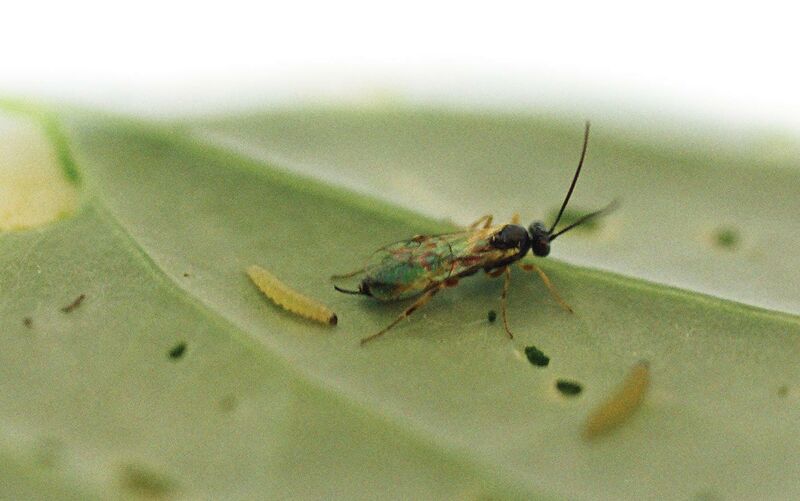 Laboratory colonies of diamondback moth and its dominant parasitoid, D. insulare, were established and analyzed at the University of Alberta and Agriculture and Agri-Food Canada (AAFC) Research Centre in Saskatoon. Further research at the University of Alberta studied the effect of plant stress on diamondback moth and parasitoid development and fitness. Field surveys provided some important finds. The first was the discovery of an unknown species of braconid, believed to be Cotesia vestalis. This species appears responsible for a very substantial level of the total parasitism of diamondback moth. Another species, Mesochorus bilineatus, was identified as a primary parasitoid of diamondback moth. Conura sp. was also responsible for a low level of parasitism in central Alberta in 2011. Parasitoids attack diamondback moth at two life stages: D. insulare, M. plutellae and Cotesia sp. attack larvae, and D. subtilicornis attack pupae. As well, two ichneumonid species Itoplectes quadricingulata (Provencher) and I. conquisitor (Say) – typically pupal parasitoids of leafrollers and other Lepidoptera – emerged from diamondback moth pupae collected in Saskatchewan, a new host record for these parasitoids. The most efficient approach to monitoring canola for diamondback moth and its parasitoid fauna is to take sweep net samples in production fields. Because populations of moths and parasitoids are not uniformly distributed, several locations within each field should be sampled. No thresholds have been established. Lab analysis found that diamondback moths were attracted to the sulphur content in canola leaf tissue. 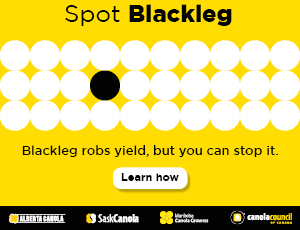 For this reason, canola producers should apply recommended levels of sulphur based on soil sample recommendations, and avoid applications that exceed recommended levels, as diamondback moth are attracted to sulphur in plant leaf tissue. Moisture stress is another factor. When water stress occurs, control of diamondback moth by natural enemies may not be as efficient compared to conditions with sufficient soil moisture levels. Canola plant density was not linked to distributions of either diamondback moth or its parasitoids.